The shortage of housing in Emmet County is well studied and documented, and reinforced by a wealth of anecdotal data from local businesses and organizations. Housing shortages affect area residents of all income levels, but are particularly acute for middle- to low-income employees of businesses in the Petoskey-Harbor Springs area. Despite this need, very little action is being taken to address our housing shortage. Clearly, there are constraints that inhibit market actors from addressing this need individually. 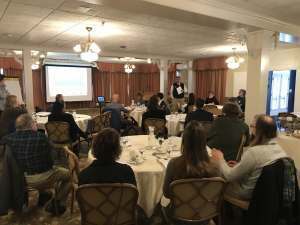 To address these constraints, a group of interested organizations and individuals has formed the Little Traverse Bay Housing Partnership. The objective for the Partnership is to bring together key members of the housing “community”—land owners, developers, construction companies, financial institutions, local governments, major employers, property managers, nonprofit agencies, technical training institutions, realtors, architects, foundations, and others—to identify and acknowledge these constraints and together develop a plan for one or more specific projects to address them. These projects would aim, within the next 3-5 years, to add between 50-100 residential units in the Petoskey-Harbor Springs area that are affordable by, and that meet the needs of, employees of area businesses and their families. These units could range from 2-3-bedroom duplexes or apartments, to efficiency or studio apartments, to “tiny homes,” and could be part of multi-family, multi-income, multi-use developments close to employment, services, shopping and entertainment, and public transportation. We intend to keep the core membership of the Partnership small and flexible, but we will succeed only by working together with all members of the housing community, and by stimulating projects in which each participant makes a tangible contribution to a collective effort while meeting their organizational objectives and remaining profitable. It is clear from discussions within the Partnership and initial development of these “case studies” that a substantial financial gap exists to make affordable housing projects feasible in this area. Therefore, an additional focus of the Partnership will be to explore and catalyze development of new, locally-based financial and organizational mechanisms that can help bridge this gap. While adding 50-100 housing units in our area is important, this alone will not address the housing shortages we experience. Therefore, the Partnership has two ultimate goals. First, we will document and learn from the experience of planning and implementing these initial projects to help identify and develop long term partnerships, mechanisms, and possibly policy actions to sustain this type of housing development. Second, by building a template for collaboration and through the example of specific collaborative projects, we aim to promote connections among people from different sectors to get together on their own to identify and develop affordable housing projects in our area.